Everyone is welcome to worship at St. Stephen’s regardless of membership or any church affiliation. 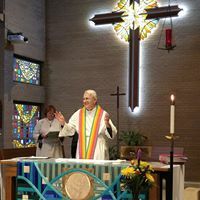 Becoming a member of St. Stephen’s is simple and usually involves participating in several educational and orientation sessions and an opportunity to be formally welcomed during a regular worship service. New members are welcomed several times a year. Members of St. Stephen’s form a joyful, spiritual community dedicated to serving and worshiping God and Jesus Christ.